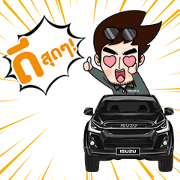 Home » Tri Petch Isuzu Sales Co. Ltd.
Tag: Tri Petch Isuzu Sales Co. Ltd.
Stickers have never been cooler than with these "Boy Pakorn and Isuzu Hi-Lander Stealth!" stickers. Friend Isuzu Thailand’s official account to get them for free.